A long time ago, I remember shopping at Costco with my Mum and she picked out a strawberry rhubarb pie. I remember her eyes were lit up and she exclaimed that it was a rare treat. Rhubarb? A treat? I've never had it before, but I knew what it looked like. Rhubarb reminded me of a celery stick that had been dyed red. I didn't have high hopes. But it was delicious! It was like eating a bite of juicy summer nights. 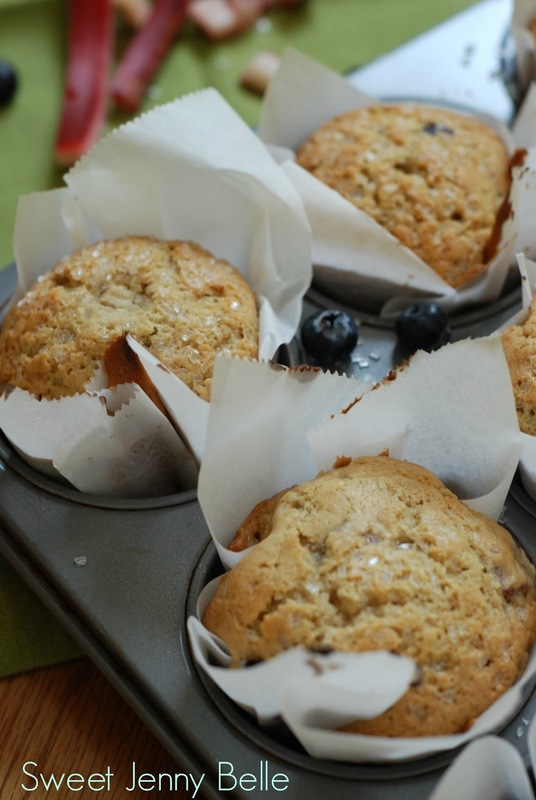 These muffins are perfect for your brunch paired with a champagne flute of mimosa. They are full of juicy blueberries and hot, sweet rhubarb. The muffin tops are gently coated with chunky sugar - it adds a perfect amount of crunch to your bite. I added a small pat of butter to one that had just come out of the oven - such happiness! 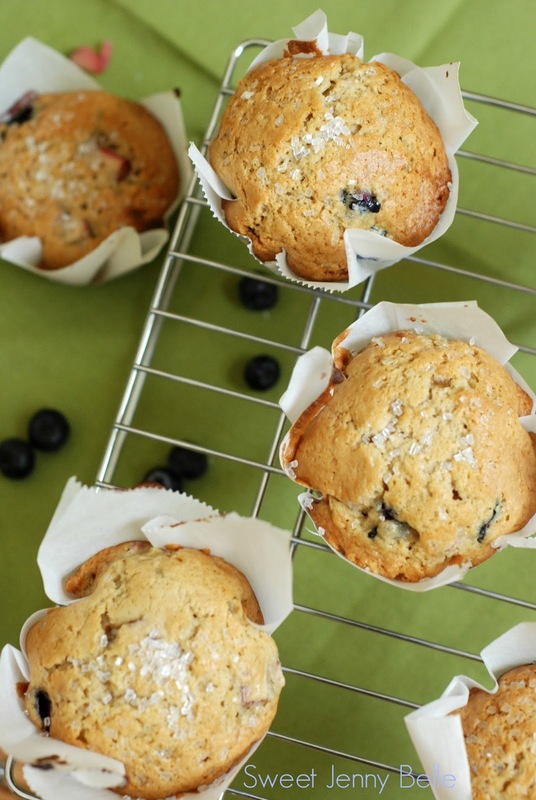 Aren't these rustic muffin cups the best? And they are so easy - they add such a fun touch to your breakfast plate. All you do is cut approximate 5" squares of parchment paper. Wrap them over the top of a champagne glass to get the shape and then place into a muffin tin. The Kitchn has a great visual tutorial if you would like to see more details. So easy and such a fabulous presentation for your yummy breakfast! 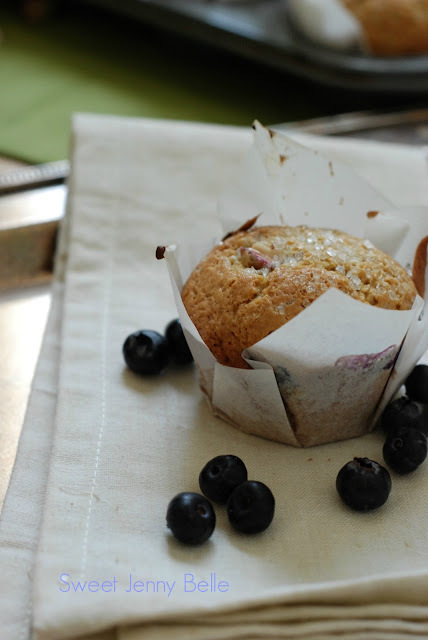 These summer muffins are the perfect morning treat for Mother's Day or a brunch with friends. They are chock full of deliciousness and topped with chunky sugar. If you make this in advance, you may want to heat them right before eating - so delicious with a small pat of butter melting on the hot muffin. In a medium bowl combine: flour, baking powder, baking soda and salt. Set aside and preheat oven to 375 F.
In your mixing bowl, cream sugar and butter together until they are light and fluffy. Gently beat in the egg, vanilla extract and almond milk. 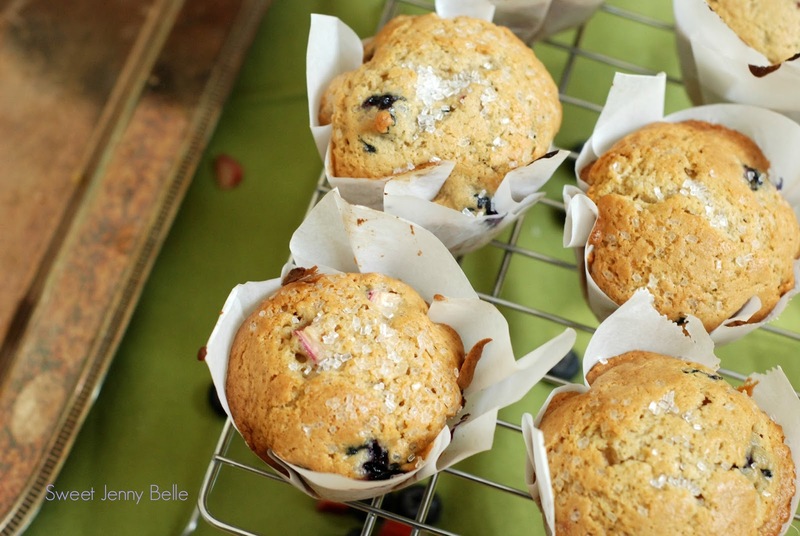 Gently toss blueberries and rhubarb in the flour mixture. 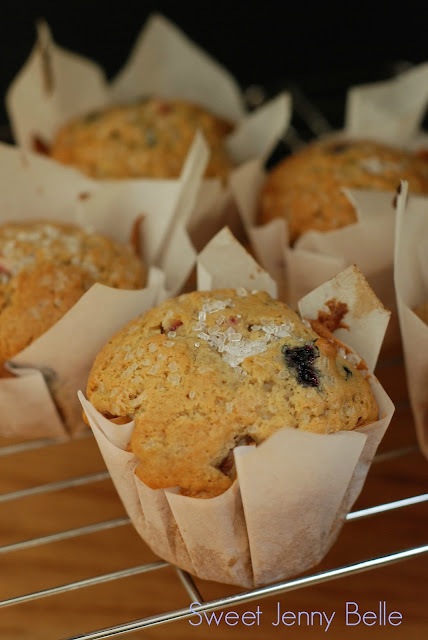 This will help prevent them from sinking to the bottom of the muffin - we want deliciousness in every bite. Combine flour mixture with the creamed egg, gently beat until mixed, but be careful to not overmix. Over mixing of the dough will cause them to be tough. Line muffin tin with parchment squares or liners. Fill muffin tins about 2/3 full and then add about a tablespoon of chunky sugar over the dough. Bake for 22-25 minutes or until they are golden brown. Enjoy! These are so good! You can make ahead and freeze, but this batch only makes a dozen and I doubt you will have any leftovers. Don't forget to Pin this recipe, I have a feeling you are going to want to make these yummy muffins more than once! What's your favorite way to use summer rhubarb?